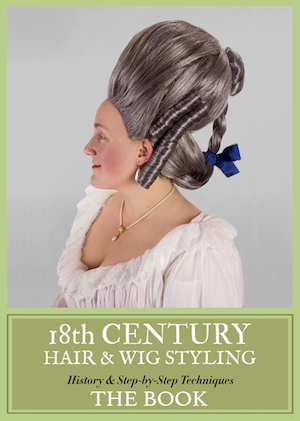 Usually, when we think of Queen Elizabeth’s life, we think of it in terms of high drama. Her fragile claim to the throne, the illegitimacy stigma that followed her for her entire life after her mother’s execution, her staunch choice to remain celibate when she was the marriage catch of Europe, her conflicting desire for love and duty … All gripping facets to a complicated, remarkable woman. 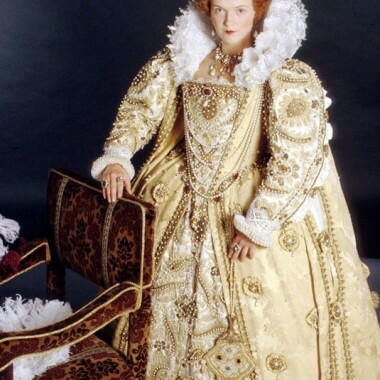 However, I’m going to dedicate this entry to a depiction of QEI that breaks with the typical dramatic spin: Queenie, portrayed by Miranda Richardson in Blackadder II. 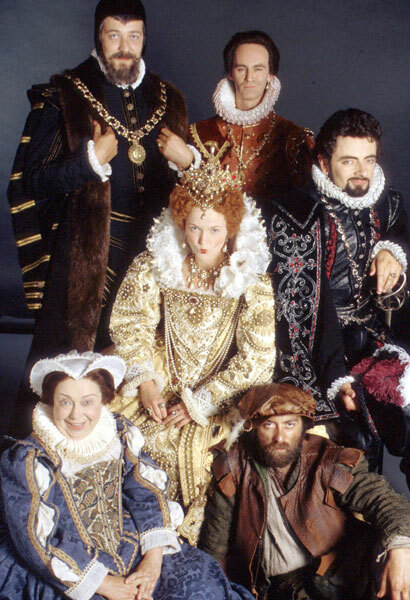 The really remarkable thing about the entire Blackadder franchise, not just the second series set at the Elizabethan court, is that this is a show with serious costuming chops. For all the silliness, the costumes by Annie Hardinge are superbly fitted and beautifully constructed, and clearly show an eye for the correct historical silhouette. Hardinge’s work in the first, third, and fourth series is great, but I think she really shows her talents in the second series, as she was given a fantastic female character that’s usually the center of everyone’s attention. 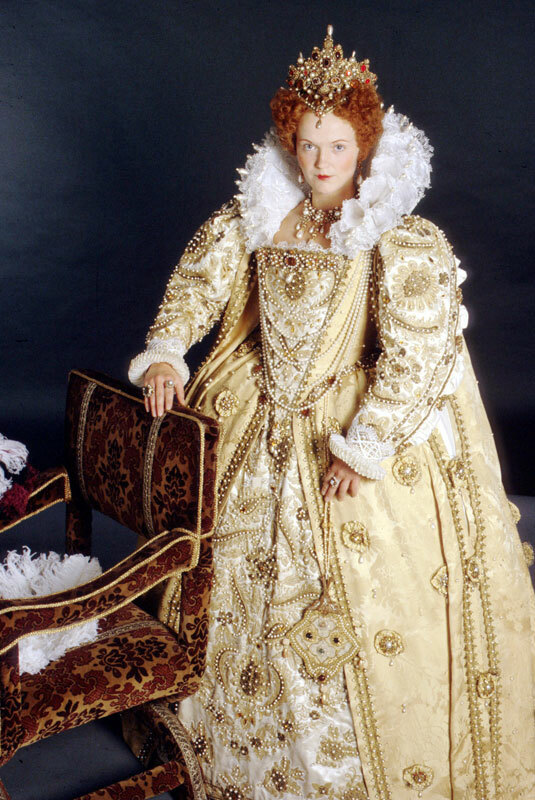 This, coupled with the choice to set the show aesthetically in the 1590s, gave her a lot of visual territory to go way over the top. 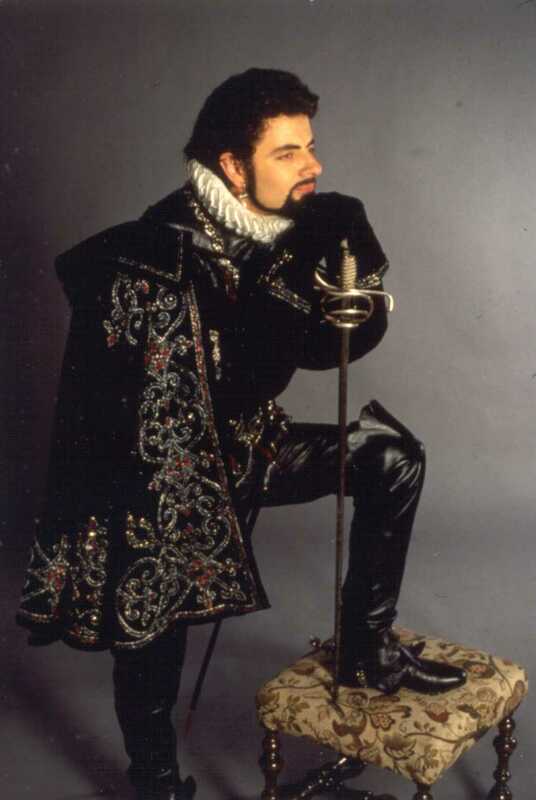 And of course, we can’t fail to mention that Lord Percy’s famous orange suit is one of the best recreations of Robert Dudley’s portrait out there. 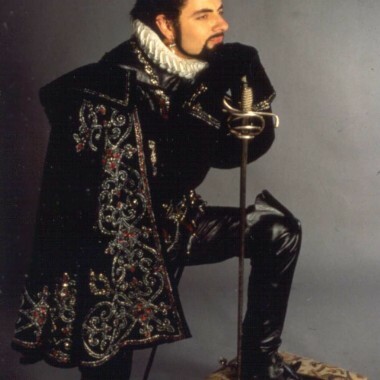 It’s also worth noting that Hardinge is the costumer on several of my other favorite British TV series, including the epically surreal The Mighty Boosh and the scathingly funny Black Books. She also has costumed Austenland, Shaun of the Dead, Extras, Spaced, Jonathan Creek, and some Doctor Who thrown in there for good measure. I love her. 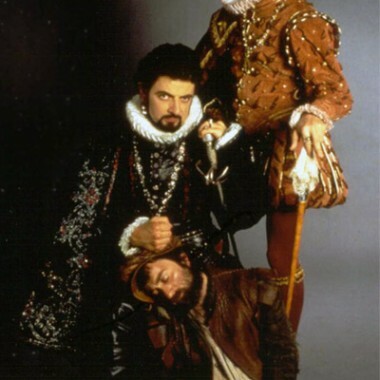 And Blackadder and I agree, the costumes are really grea! 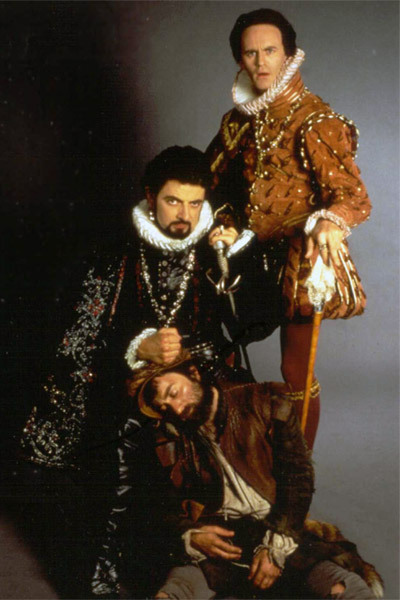 Stephen Frye IS Lord Melchett. 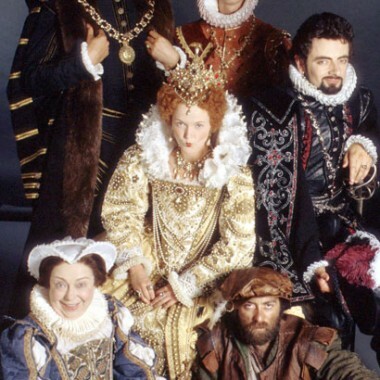 I’m not sure anyone else could have been that role and made it work opposite Miranda Richardson and Rowan Atkinson. Oh yes, he is perfect! And Rik Mayall’s short but memorable attack-acting. Of all the series, the second one will Always be my favourite. I’ve decided to keep the cash, have a whizzy-jolly time, and try to forget both of you. Hope you’re not too miffed. BYEEEEE!! !